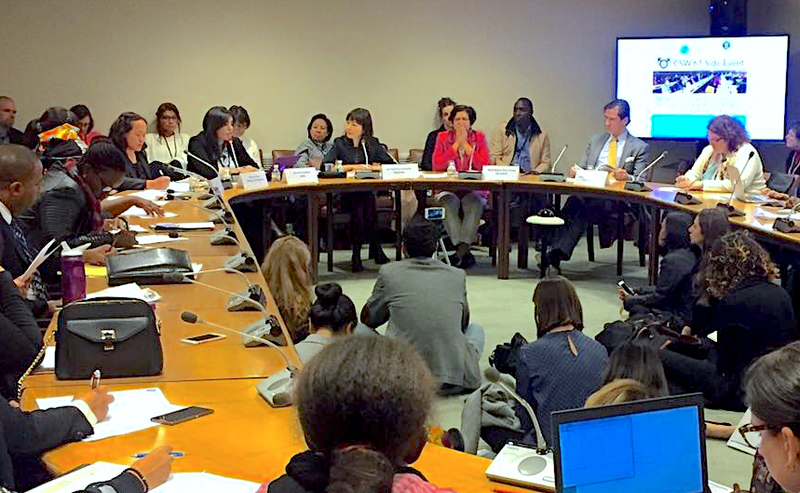 The first event, focused on deepening a conversation with fellow grassroots and NGO advocates, was on 20 March, at 12:30 pm, on the second floor of the Church Center (777 United Nations Plaza #8g, New York), as part of the NGO CSW Forum. Download the flyer for this event. The second event, held in partnership with the Ministry of Foreign Affairs of Finland, was in the UN Building in Conference Room B on 22 March, from 10:00-11:15 am. Download the flyer and the concepte note for this event. Maria Virgínia Brás Gomes, a Member of the UN Committee on Economic, Social and Cultural Rights (CESCR), who co-authored General Comment 23 (April 2016) on the right to just and favorable conditions of work, was on the panel of the second event together with Women and ESCR Working Group members. Members of the panel highlighted the impact of global economic policies on women’s rights, shared specific cases and grassroots struggles of women directly impacted by various forms of injustice and systemic inequality (with a focus on domestic workers, the care economy and the exploitation of workers), and discussed strategies for utilizing the international human rights framework. Working Group members who attended and/or participated in these parallel sessions include: Asia Pacific Forum on Women, Law and Development; Association for Women’s Rights in Development; Bulgarian Gender Research Foundation; Center for Women’s Global Leadership; Collective for Research & Training on Development-Action; Defend Job; EnGender Rights; Escuela Nacional Sindical; Federation of Women Lawyers; Hakijamii; Instituto de Liderazgo Simone de Beauvoir; Initiative for Gender Equality and Development in Africa; International Women’s Rights Action Watch Asia Pacific; Kebetkache Women Development and Resource Centre; and National Union of Domestic Employees. Several Working Group members organized parallel sessions and were invited to speak at various events. Please visit https://www.escr-net.org/events/upcoming for more information. Please let Aya Fujimura-Fanselow (afujimura-fanselow@escr-net.org), Program Coordinator of the Women and ESCR Working Group, know about your events, and we would be very happy to circulate the information. Additionally, members of the Women and ESCR Working Group—who were in New York for CSW and who are interested in taking a lead role or participating in efforts under the Working Group’s action area of “right to work”—held a daylong strategy meeting on Sunday, March 19. Again, please let Aya (afujimura-fanselow@escr-net.org) know if you are interested in joining this discussion. The Commission on the Status of Women is the principal global intergovernmental body exclusively dedicated to the promotion of gender equality and the empowerment of women. The CSW is instrumental in promoting women’s rights, documenting the reality of women’s lives throughout the world, and shaping global standards on gender equality and the empowerment of women.